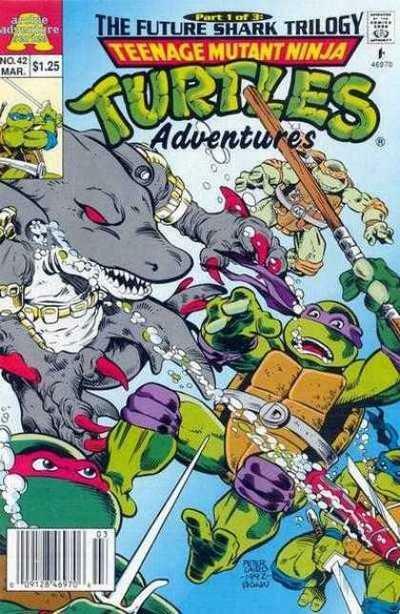 6) Armaggon: This mutant shark is undoubtedly one of the most visually striking of all the Turtles’ villains. He just looks so darn evil and scary! He, of course, hails from the aforementioned “Future Shark Trilogy,” and I would love a chance to pit him against the Green Machine. It would be a dream come true to get, not only Armaggon himself, but also his warmachine. However, that would almost be overkill, as the ghastly gray one is a walking arsenal as is. If you look at the image above, you’ll notice those weird lumps on either side of his face. Yep, those are rocket launchers in his SKIN. While this may seem almost Liefield-like, I thought it was pretty neat as a kid, and I have to say that he’d make one heck of a foe in FF. Likelihood: Almost Impossible. This would be an extremely difficult skope, if it would be possible at all, and I doubt Armaggon is popular enough to elicit that kind of effort. 5) Wingnut and Screwloose: A deranged bat-like alien and his overgrown mosquito sidekick, these two anti-heroes would make for a really great addition to the Turtles’ allies, as well as providing a fun mission or two. Wingnut was another of my favorite Turtles toys once upon a time, though at the time I didn’t get the joke of a paranoid mutant bat in a blue and gray outfit, complete with utility belt. I have quite a good idea about how to build them into the game, and I think the addition of a flying character would give the players some nice options. Given Wingnut’s…issues…he’d certainly have to have the “Mad” attribute, and these guys would definitely need “Charged Pair.” I suppose I’d create Screwloose as a sidekick that always came along with Wingnut. It would make them pretty unique, which is something I’m going for in my designs. Likelihood: Very Slim. While I think Wingnut would be possible to skope, it would be pretty complicated, and Screwloose would be tough as well, though he could probably use parts of Gren’s Beetle. 4) Leatherhead: This mutated alligator is an enemy of the Turtles in the cartoon and an ally in the comics. I’ve always loved him a s a villain, and the dynamic between him and the Punk Frogs is great fun. How can you not like the idea of a back swamp trapper turned real life leatherhead? As part of the Mutanimals he kind of gets lost in the shuffle. As a good guy he’s just not as interesting as Mondo Gecko, Man Ray, or Wingnut, at least not to me. He’s another one I’ve already given some thought to in terms of FF build. What with an alligator’s physical power, and a variety of traps and weapons, I think he’d make a nice opponent, especially in some missions dealing with the Frogs. Likelihood: Fair. I don’t think he’d be too hard to skope, and Leatherhead is a pretty popular character. Well, thanks for reading folks. Come back tomorrow as we reach number one!